2 Seas the Day East and West: Brand-new multi-year renovation complete with new updates throughout! Great place for a family reunion, rent both sides (4 bedrooms on each side for a total of 8 bedrooms) or rent one side only. RATES LISTED ARE FOR ONE SIDE. Located directly on the ocean with breath-taking views. Expansive remodeling in 2016 and 2017 with new flooring throughout, new painting, new furniture and bedding, new bathroom fixtures, and the entire house was newly redecorated with cool and relaxing beach decor. It is clean and fresh, and you will absolutely LOVE this house. Two master bedrooms upstairs both with queen size beds and their own private bathrooms. One of them is oceanfront with it's own private balcony. There are two bedrooms downstairs - one with a queen size bed and the other with 2 full size beds. These bedrooms share a buddy bathroom. There is also a huge deck with built in seating on the first floor. You even have an enclosed, hot and cold water, outside shower. The family room of each side has a beautiful two-story cathedral ceiling with a wall of windows to enjoy the amazing views of the Atlantic Ocean. We often see the dolphins swimming and playing right in front of the house several times a day! Staying Oceanfront is the best way to go!! Just walk out the door and down a few stairs and you are on the beach! You don't have to worry about finding a place to park or dragging the beach gear all over the place. Plus, no more worrying about where to go to the bathroom. You can go and come from the house to beach with no worries! We are pet friendly (up to two dogs). Absolutely NO smoking. A $150 charge will be applied to each rental for fresh linens (includes bed linens, bath towels for all 4 bedrooms, and kitchen towels), and for cleaning services. We rent this from Saturday to Saturday. We will consider partial weeks/weekends, only during Off-season if not previously rented. Beach is 50 feet out the back door! Enjoyed our stay, weather was rainy but we had good family time. Plenty of bedrooms and space for the whole family. Kitchen was not well stocked but we got what we needed at the grocery store. Great views of the beach! Great beach area, comfortable beds, plenty of seating. Only one complaint, kitchen could use some maintenance. We did enjoy everything else. Loved the short, and I mean short, walk to the sand and the huge deck where we sat around drying off while discussing the day. Plenty of space for a large group to eat or play board games after dinner (we cook in). I like the quiet neighborhood and openness of the beach - didn't have to fight for space. We took both sides for 20 of us. It served us well. This house was perfect for our large extended family. We were able to rent both sides and had a wonderful stay. Since there are 3 1/2 baths on each side, no one had to wait to go to the bathroom or take a shower. And bonus, the kids loved the outside enclosed showers, so they had ‘real’ showers after daily beach time (less sand in the inside showers for the adults!). 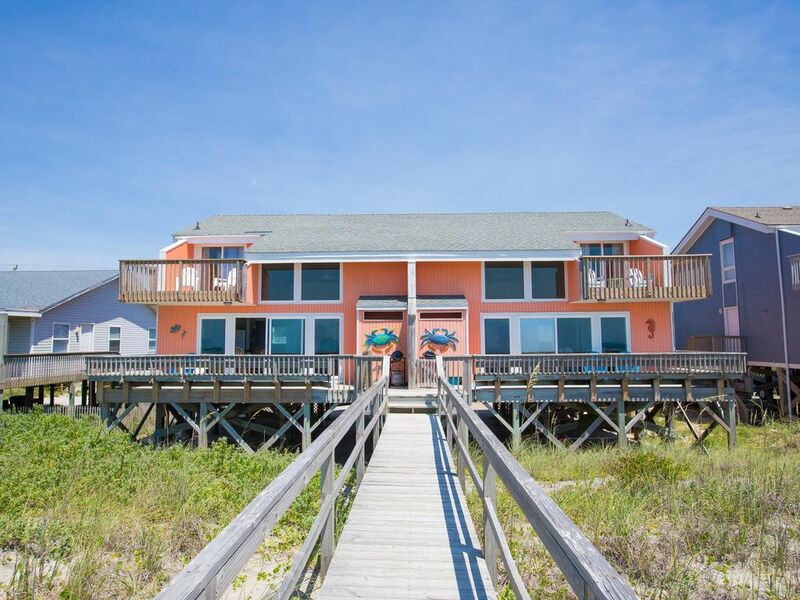 The house’s location, the view and the proximity to the beach made for the most wonderful and relaxing vacation. Having the beds made and lots of clean towels ready when we arrived was an extra bonus. Super-cute decor also! Wonderful stay!! Rates are listed per side. You can rent the entire house or just 1 side. We rent linens from a local company on Emerald Isle.